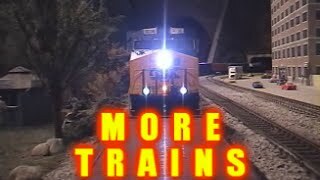 More of the biggest Train videos for Kids is a fun train video for all train lovers. Music by James Coffey! This video is one your kids will love and want to watch over and over again. Song Lyrics and Free offer below! More trains for kids Entertrainment Junction video features the world’s only railroad-themed family entertainment center, EnterTRAINment Junction which offers the largest indoor train display at 25,000 square feet with more than two miles of track and 90 trains depicting every era of American railroading. Entertrainment Junction, they’re coming down the line. Entertrainment Junction, they’re running rain or shine. Entertrainment Junction, the best that you can find. Entertrainment Junction, we’re having a good time. Entertrainment Junction, we’re having a good old time! Here they come! Huffin’ and puffin’ on down the line, it’s Lots and Lots of Toy Trains! Two of the greatest toy train DVDs we’ve ever offered. And now, through this special TV offer, you’ll get two DVDs for the price of one. You’ll get to see holiday trains, spooky trains, alphabet, counting, and garden railway trains. Even trains that you can ride! There’s toy trains of every shape and size. Plus, little brick trains, and much, much more when you order Lots and Lots of Toy Trains! Each DVD is jam packed with lots of fun sing-a-long songs and close-up model railroad action. As a special bonus, you’ll also see real live steam trains in action. This offer is not available in stores. So, get two DVDs for the price of one! Get Lots and Lots of Toy Trains! (c) 2015 Marshall Publishing & Promotions, Inc.